Uxbridge sits on the very edge of West London, the town's name derives from ‘Wixan's Bridge’, a Saxon bridge located on the Oxford road where a modern bridge now stands. The Wixan tribe settled in West Middlesex in the seventh century and the earliest records of a settle- ment are from the twelfth century, when St Margaret's Church was built. In the 1960s Uxbridge embraced the twentieth century with a new dual carriageway connecting Hillingdon Road with Oxford Road, multi-storey car parks and brand-new office buildings. In this wander about Uxbridge, I explore the green spaces and the general greening of the landscape. A good place to start is at the bridge, although there are three bridges between Uxbridge Underground station, the western terminus of the Metropolitan and Piccadilly lines, and Buckinghamshire. The first is over the Frays, which is in a mill race channel. The Frays is an artificial river that leaves the Colne just north of Uxbridge and rejoins at West Drayton. The next bridge is over the Grand Union Canal, which links London to Birmingham. The canal is fairly rural and has a good towpath for long- and short-distance walking. From Uxbridge there are good day's walks to be found south to Brentford and north to Watford. The third bridge is over the Colne, a large river which was used to power mills and so has been divided into various mill races, several of which converge here. Overlooking the river is a block of flats, Denham Lodge from 1968, which has a splendid private garden that can be seen from the road. It has a large sculpture of figures playing with a ball; it is made of plastic but coloured to look like old copper. The Colne forms part of the London Loop. An easy section to view is in St John's Road, where mature willow trees grow along the river in informal open spaces. Near here is Riverside Way, a new industrial estate, which I explored while looking for, as it happens, a nature reserve that was locked. Uxbridge Moor, run by the London Wildlife Trust, is an island reserve sandwiched between two branches of the River Colne. Riverside Way is still worth a visit as a good example of the mainly trimmed shrub landscape that is used in such developments. Uxbridge has two main parks. 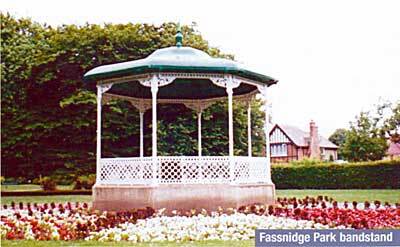 Fassnidge Park was donated by the widow of a local landowner and was laid out in 1926 by William Lionel Eves. Apart from the modern children's play equipment the park is much as it was when originally laid out. There is a memorial drinking fountain, not in use and having lost its plaque, a Mediterranean garden with spiky exotics and a stone commemorating the 200th anniversary of the founding of Uxbridge, Massachusetts. The bandstand has bright bedding around it, while the remaining landscape is trees and grass. There are good facilities for children and adults, including a skate park, play area, putting and bowling greens and tennis courts. The Frays, freed from its mill race, runs by the southern approach to the park. The plaque on the bridge is worth reading: it is about weight limits. The Frays continues into Rockingham Park, a large expanse of informal playing field with some natural play equipment. A short walk across the dual carriageway brings us to the Old Burial Ground of St Margaret's. This was opened in 1576 and closed in 1855, after which it was laid out as a public park. When the new road was built, the war memorial was moved here. Walk up Old Windsor Road and along the High Street, and you will arrive at Hillingdon Civic Centre. This red brick building by Robert Matthew, Johnson Marshall & Partners dates from 1973-8 and includes parts of William Curtis's thirties-designed Middlesex Council offices. The front is decorated with bedding in bright yellows and orange. At the back is a complex open space of shrubs, trees and paths with seats. It is a remarkably quiet and relaxing area. A short walk south from St Andrew's Church will bring us to Manor Waye, an estate of social housing from the thirties. It has a small local park, called Manor Waye Recreation Ground, with some under-twelve play equipment, a basketball net and a football goal (yes, just one of each). The surrounding trees, mainly limes, are good. One thing that is notable about the centre of Uxbridge, at the time of my visit in August, is the amount of floral display. There are planters and hanging baskets all over the place; even on the barriers in the centre of the dual carriageway relief road. One area not at its best is the underpass by St Andrew's Church, which looks as though it is undergoing a makeover. Meanwhile bindweed is making a very good job of growing as ground cover. There are also lots of trees in the town. Not only street trees and trees in planters, but also trees planted in small patches of land close by the office buildings. The large roundabout to the south of the Atrium, a massive office block, is a mature mini-forest with a grass border. In contrast to the riotous colour of the town centre is Uxbridge Common to the north west of the town. This is a rectangular patch of traditional common land. It is mainly grass with the area to the north being acid grassland, a rare and important habitat in London. There is also an area of scrub and gorse and a wildlife pond. Although it is bordered on one side by a main road, the noise drops off as you walk away from the road. Brunel University is to the south of the town. It is best to enter from the east side to get a feel for the history of the buildings. The university's roots can be traced back to 1798. In 1962 it became a College of Advanced Technology and shortly after it was agreed that a completely new college should be built on a site which formerly had been the Lowe and Shawyer nursery and market garden. The cut flower industry is commemorated in the four chrysanthemums in the crest of the Arms of the Borough. The lake in front of the original reception building is in the cutting for the Great Western Railway line to Uxbridge Vine Street. To the left is a rock garden given by John Crank in 1981, when he retired; it is looking a bit overgrown. Behind this is an area of grass, some shrubs and low walls and seats, and it has recently gained a trim gym. Standing by the path is a statue of Brunel given by the Harbin Longway International College. The main path now leads through an area of student facilities. The campus buildings, designed in the Brutalist style, are by architects Richard Sheppard, Robson & Partners; Stillman & Eastwick-Field designed the laboratories. 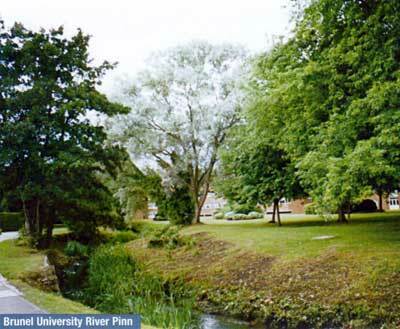 The river Pinn, which rises in Harrow Weald and joins the Frays, runs through the middle of the campus where the residential blocks are. There is an area of new building mainly in white and silver, by several architectural practices, including YRM Architects and David Morley Architects. These have been added as the University has closed campuses in other parts of west London. They reflect the expansion of the University into subjects other than engineering, which were previously taught on other outlying sites. Planting in this area of the campus is mainly large colourful planters. The main entrance to the university is now on the west with a magnificent entrance roundabout with much more colourful planting. Over the road is the Hillingdon and Uxbridge Cemetery. We enter this from the back door, but that is for convenience. The Uxbridge part opened in 1855 and the Hillingdon section in 1896. The main entrance is on Hillingdon Hill. This is a double lodge by Benjamin Ferry and is in poor condition. The chapels are in better maintenance and around them there are many modern colourful grave markers. The rest is rather rundown, although some individual graves are maintained. In some areas the land is becoming overgrown, but there has been some clearance work. Surrounding Uxbridge are sports fields, golf courses and even some farm land. This is rural Middlesex. It still has a country feel even if the centre of Uxbridge is a location of industry. The town centre is very green thanks to the involvement of the council and businesses. Many pubs have decorative hanging baskets, even those out of the town centre, such as two I came across in St John's Road. St Margaret's has pot plants on the small area of land by its door. The Salvation Army, in a new modern office-like building has plenty of shrubs. The garden of the Quaker Meeting House of 1818 is a quiet haven. It is a bit run down and was locked. I do so hope it can be brought back into use. As well as the municipal efforts many private businesses have colourful floral displays. Creepers have been planted on the outer walls of the, recently renamed intu Uxbridge shopping centre. All in all, Uxbridge is a town in bloom.